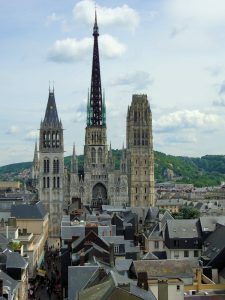 Rouen offers a restored medieval quarter and a marvelous Gothic cathedral. Rouen has had a turbulent history. The city was devastated several times during the Middle Ages by fire and plague, occupied by the English during the Hundred Years War, and where the French heroine Joan of Arc (Jeanne d’Arc) was tried for heresy and burned at the stake in the central square in 1431. During WWII, Allied bombing raids laid waste to large parts of the city, especially the area south of the cathedral, but over the last six decades the city has been meticulously rebuilt.